It's about that time again - Halloween night! And I've got a great tag for you, combining some of the fun accents from My Mind's Eye and Bo Bunny with a bit of Tim Holtz. 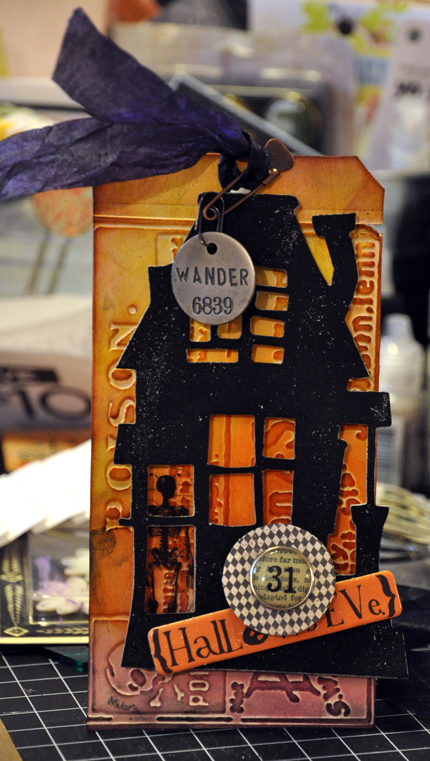 To make the background of the tag, I ran a tag through my Vagabond with a Tim Holtz texture fade - one of his fun Halloween ones. I then inked the tag with several of his new fall seasonal inks, seedless preserves and ripe persimmon, along with a bit of wild honey and black soot. Next, I cut a piece of grungepaper with his rickety house die then coated it with black distress crackle paint. After the paint dried, I attached it to the tag with foam dots and added my accents.